As an animal, your nervous system allows you to sense and respond to your environment, form and retrieve memories, and learn from past experiences. All of this is possible because the billions of nerve cells in your brain and spinal cord are connected to each other and to other cells throughout your body in very precise ways. Although our brains change as we grow and age, many of the most fundamental connections are formed very early during embryonic development. And, although everyone’s brain is unique, basic patterns of neural connectivity are shared in humans and non-human animals alike. Our lab is interested in how animal nervous systems are properly wired during development. 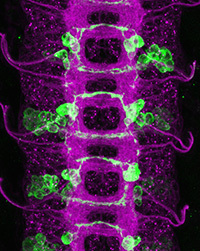 Using the embryonic insect nervous system as a model, we study the genetic, molecular, and cellular mechanisms that specify patterns of neuronal connectivity. We use insects like the fruit fly Drosophila melanogaster because they have relatively simple nervous systems, but they are built using the same principles as more complex brains like our own. The molecular and genetic tools available in Drosophila allow us to manipulate genes and cells in the developing fly embryo while we examine how they assemble themselves into a functioning nervous system. For more details about specific projects we are working on in the lab, see our Research page. Tim, Ben, and Muna traveled to Dallas, TX for the 60th Annual Drosophila Research Conference. There was lots of great science, old and new friends, and just the right amount of Texas BBQ. Tim returned to Bloomington IN to give an invited seminar at his PhD alma mater, Indiana University. Thanks to Justin Kumar and the rest of the Biology department for a great visit! The January 2019 issue of Seminars in Cell & Developmental Biology features a collection of reviews on the topic of Axon Guidance and was guest-edited by our own Tim Evans. Check out the issue at the link below. Tim gave a talk on our lab's research today to the UA Neuroscience group, as part of the UA Neuroscience lunchtime lecture series.